Architecturally, the conceptual inspiration was drawn from the site and situation. Located on the edge of the Loch Palm reservoir and golf course, the site is positioned between two geometrically flat, level surfaces and is an edge site – between water and earth. A moment of tension occurs where the two meet – before the wind and metaphysical forces create a ‘fold’ in space. 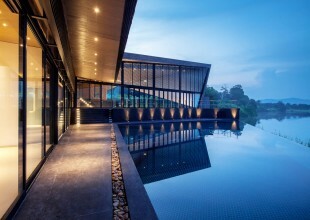 Reduce from 26m THBThis luxe, modern home comprises a U-shape house with two-storeys which surrounds the large private swimming pool. This luxurious abode offers six bedrooms that all own en-suite bathrooms, a lounge, study/office, family room and a Western kitchen. A lovely private villa in a mature gated community.While exploring the palm-clad Koh Samui hinterland, you would hardly expect to find an uber-stylish, contempo residence tucked away down a local road. Villa Koru is just that.